While snails with cap-shaped shells have evolved multiple times across the Gastropoda, Patellogastropoda represents the “true limpets.” These are the limpets that are commonly observed at rocky intertidal habits, where individuals cling to rocks as they are pounded by the surf. All living species are marine, though not all are associated with shallow water. Some like the Neolepetopsidae are associated with deep sea vent communities (Nakano and Sasaki, 2011). 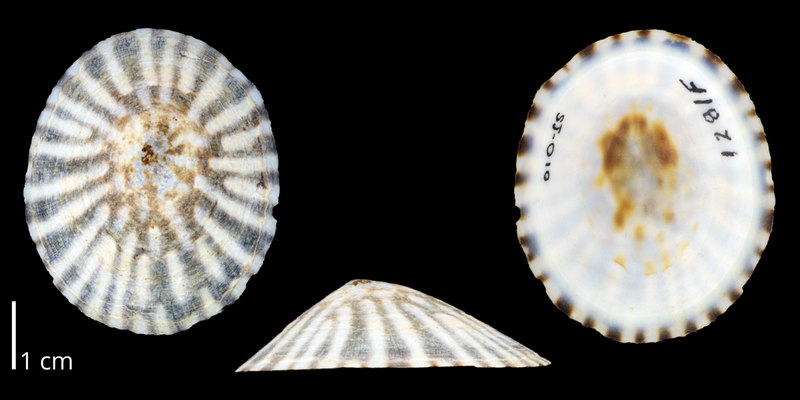 Modern Lottia pelta, collected off Orcas Island, San Juan County, Washington (PRI 70356). Patellogastropoda may the basal-most clade of modern Gastropoda and the dated molecular phylogeny of Zapata et al. (2014) suggests that the clade originated in the early Paleozoic. Gofas (2009) recognize the following gastropod families as members of the Patellogastropoda († indicates extinct families). This list was copied from the World Register of Marine Species (WoRMS) on February 14, 2017 and is reposted here in concordance with the source material’s Creative Commons BY 4.0 license. The link associated with each name will direct you to additional information about that family on WoRMS. Nakano, T. and T. Sasaki. 2011. Recent advances in molecular phylogeny, systematics and evolution of patellogastropod limpets. Journal of Molluscan Studies, 77: 203-213. DOI: doi:10.1093/mollus/eyr016. Link. Zapata, F., N. G. Wilson, M. Howison, S. C. S. Andrade, K. M. Jörger, M. Schrödl, F. E. Goetz, G. Giribet, and C. W. Dunn. 2014. Phylogenomic analyses of deep gastropod relationships reject Orthogastropoda. Proceeding of the Royal Society, B, 281: 20141739. DOI: http://dx.doi.org/10.1098/rspb.2014.1739. Link.